In my previous post I explained how to configure and process an advance shipping notice that was received from a vendor, or what I call the “inbound ASN”. But what about notifying our customers whenever we ship something to them? We’d like to send them a shipping notice in advance as well. Well, this functionality has been present in AX for a while now, and can still be used today. You can read more about configuring and processing such an “outbound ASN” in the following blog post with a technical description available on MSDN. 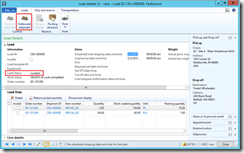 But in this post I would like to describe how to configure and process an outbound ASN using the new Warehouse management solution data model and processes. The ASN, as I mentioned before, is a standard service based on the AIF framework, so before we walk through the configuration of the data, we need to ensure that the AIF framework and the corresponding service is up and running. 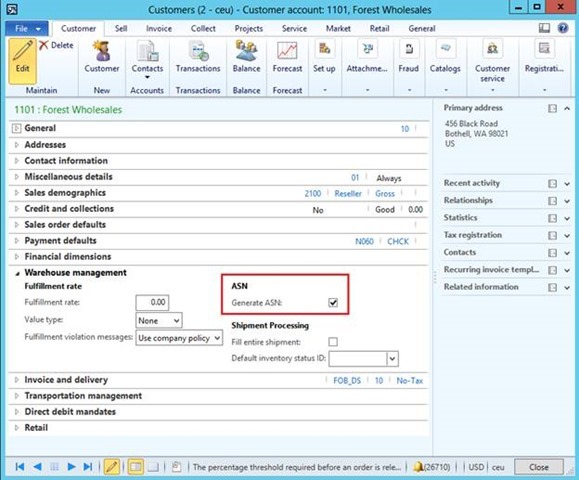 Same as before, if you aren’t familiar with the AIF in AX 2012, see TechNet. You can also take a short-cut and set up AIF automatically by using the tool that I recently posted in my blog. The service that provides the outbound ASN capabilities is the same as for inbound and is called WHSShipmentASNService. The service operation that is used for generating the ASN is called WHSShipmentASNService.read. 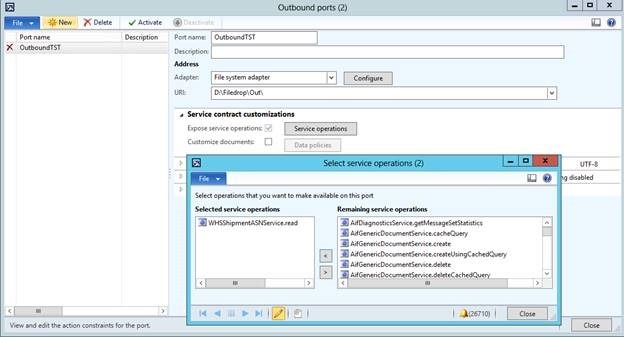 Here is how the outbound port should look after configuring the service operations. 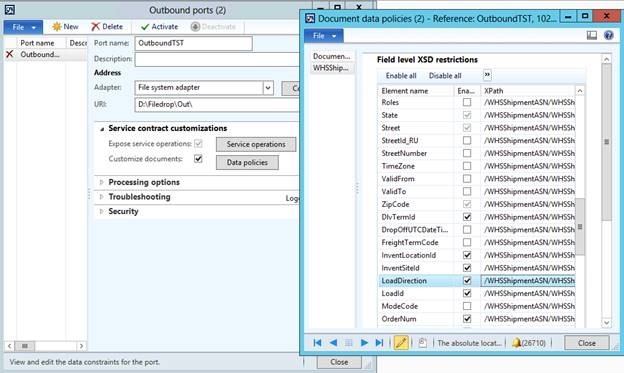 OK, now we are ready to activate the outbound port and move on to walking through the flow of sending an ASN in Dynamics AX. 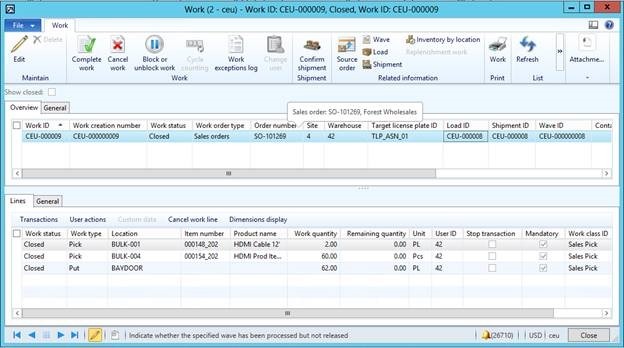 In order to be able to send an advance shipping note to a customer, we need to enable this on the customer, under the Warehouse management fast tab. This way you can clearly distinguish which customers need to receive an ASN when the shipment is being sent. Especially useful if you ship large loads which contain multiple shipments for multiple customers. 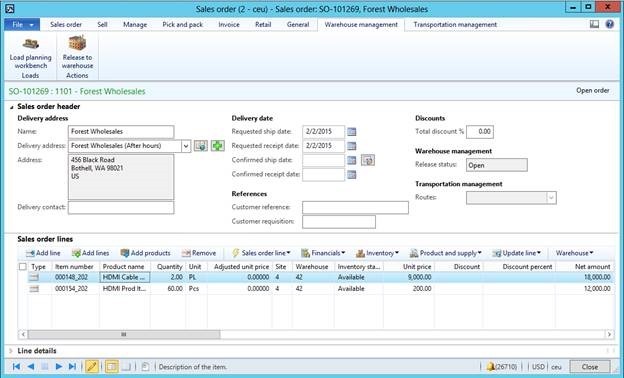 Let us create a new sales order for the above customer, and add a few sales lines for WHS-enabled items to it. Ensure the lines are physically reserved, and then release the order to warehouse. Now that the goods are picked and loaded onto the truck, we need to confirm the outbound shipment, print the packing slip and send the driver on his way. After that we will be able to send the advance shipping note to let the customer know the truckload is on its way. 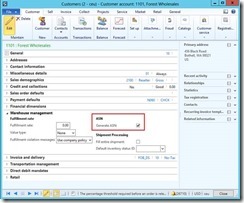 These steps can be done from a number of forms in Dynamics AX, and in this post I am just going to do it from the Load details. OK, now that the packing slip is printed, we are able to send the ASN. The Send ASN button gets enabled earlier, before we have printed the packing slip. However, clicking it will not actually do anything. You need to print the packing slip first. If the selected load is part of Transportation management system route, all loads on that route will need to be in the Shipped state with packing slips printed, same as for the load above, before the ASN can be sent. 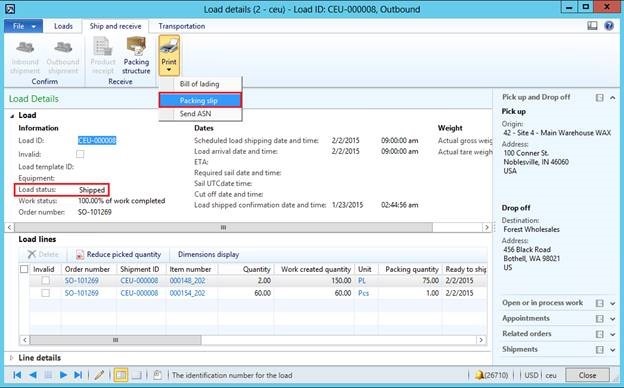 You can send the advance shipping note for more than one load at the same time, by multi-selecting the loads in the Load planning workbench or the All Loads list page / details page. Same goes for shipments if that is where you are sending the ASN from. 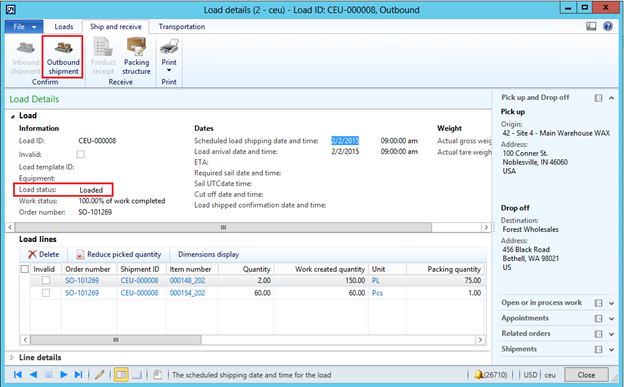 Each shipment that is part of the load will have an individual ASN document, assuming that it is enabled for the corresponding customer, as described above. There is no infolog message shown to the user to confirm that the ASN has been created successfully, but you can tell whether that happen if you look at the AIF document queue. It is currently not possible to send the ASN a second time. Here is how the ASN document looks for my example. You can download the file here. Class WHSShipConfirm contains the majority of the business logic around sending the ASN, with sendASNAllLoads() being the main entry method for the procedure. Method generateASN() takes care of creating the packing structure corresponding to the shipment. It loops through all the relevant work orders, creating a UOMStructure record for each new target license plate (which corresponds to the different pallets that are part of the shipment). 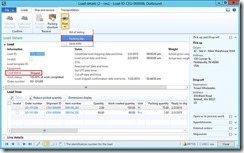 It will then for each load line loop through the corresponding inventory transactions (With StatusIssue == Deducted) and create the ASNItem records for each of the load lines items, taking into consideration the inventory dimensions of each line. This happens in method createASNItems(). Once the data structure is populated for the shipment, the document is generated and processed in the method sendElectronically(). It will never create a nested structure where multiple cases are put on the pallet; it will always be the individual items directly on the pallet. You can also download this blog post as a Word document from here.